To be able to look at something and imagine how to do it differently is the gift that frees the soul, writes Joan Chittister. 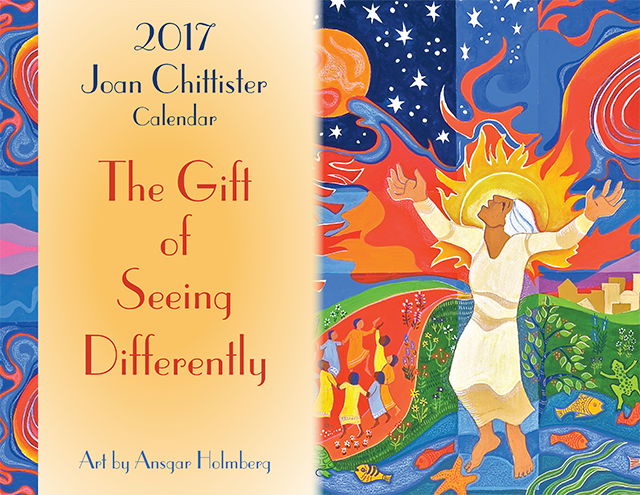 The Gift of Seeing Differently: 2017 Joan Chittister Calendar is about freeing the soul. The insights of Joan Chittister, the words of Scripture and the bold art of Ansgar Holmberg give you a new opportunity each month to see, think and construct your world differently. To discover how God dwells among us in surprising forms. On each calendar page a quote from Joan Chittister pairs with a verse from Scripture. Together they illumine Ansgar Holmberg's vibrant artwork. About the artist: The artist for the calendar (and the 2017 The Monastic Way) is Ansgar Holmberg, a Sister of St. Joseph, who strives through art to reflect her community's call to love God and neighbor without distinction, that neighbor being all creation. An inclusive artist and illustrator, her paintings appear in numerous periodicals and publications and are found in parish communities, retreat centers, schools, homes, across the US, Canada, in Europe and Australia. Her art is influenced predominantly by her teacher in community, Sister Cyril Clare, and by her studies and work with her mentor Ade Bethune. Ideas flow from Scripture, neighborhood, experiences in other countries, someone's chance remark, and the children she taught and whom she continues to teach through her illustrations for them.